Below is an excerpt from the Scientific Commitee on Antarctic Research website. There is a two week summit going to be held next Nov. in Washington D.C. The primary goal is to work to maintain a "cooperative planetary-scale governance". 1.The Antarctic Treaty establishes the first international space managed in the interest of all mankind where no acts or activities taking place while the present Treaty is in force shall constitute a basis for asserting, supporting or denying a claim to territorial sovereignty. 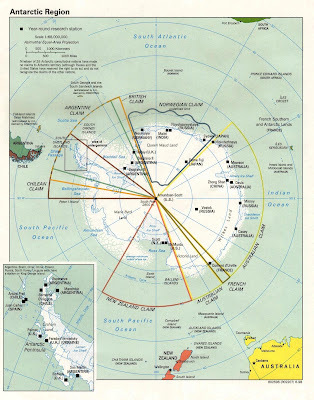 10.The scientific basis of international cooperation founded by the Antarctic Treaty offers humankind an institutional precedent for the peaceful governance of international spaces;"
The maps I've uploaded are truly hypothetical. Nations have made claim to their territories, yet are not fully recognized. Does this mean that Antarctica is open to any nation or perhaps any person? If a micro-society living in a large nation wanted to migrate to the South Pole, could they do so? Things seem to be more complicated than they were for the early explorers. Nowadays there are rules and regulations (i.e. environmentally protected spaces) that hinder the freedom to explore. Here at McMurdo I just can't walk anywhere I want, I have to get clearance to walk certain areas. Territory has been made for environmental, safety, and scienctific objectives. I'm not complaining of such, but the point is there does exist 'open' and 'closed' spaces in Antarctica. If Sir Gould is correct, then man's quest for enlightenment and order must reside in the unity of all people on Earth. Since all the desired or hypothetical territorial claims come to a point of unity, the South Pole, I believe that is where they should meet, not so much in practice but moreso in theory. Likewise, although the 46 nations that have signed the Treaty represent 90% of the human population, why don't we cut out a slice for the other 154 nations. I mean if we're seeking a true "cooperative planetary-scale goverance" all voices must be heard. Not only that, but planetary-scale also means the animals and plants that inhabit our planet, they too need a voice and right to govern. I think that the Penguin committees that roam the ice have more of a say in goverance than any human society because they've been here much longer. If we get in their way, let's move. The best way to operate such a global goverance would be to first establish a lead, which would be the elders... or in other words the animals and plants that have existed for thousands if not millions of years, and then secondly to incorporate all nations into the Antarctic Treaty, including nations not politically recoginized (i.e. aboriginal nations). Maybe the aboriginal nations of the Arctic would have a thoughtful opinion in regards as to how to maintain peace and harmony with the icy environment.